David Pogue, personal-technology columnist of The New York Times and regular columnist for Scientific American. Ori was assisted by James Tanner, genealogy blogger at Genealogy's Star. James stepped in at the last minute to help with the MyHeritage presentation when their founder and CEO, Gilad Japhet had to pull out for personal reasons. David Pogue gave us a wonderful start to the 3rd and final day of the conference, with some great jokes and comedy sketches relating to personal technology and gadgets. David also showed us that he is not just a technology geek, he is a talented composer, singer and musician to boot! I had already noticed the grand piano on the stage, but had not anticipated such an amazingly humorous performance from a technology journalist - WOW is all I can say! I couldn't resist recording one of the songs he sang (Sounds of Silence) and posting it below (apologies for the poor quality of my recording - you should be able to watch a much better quality when RootsTech post the Saturday recap videos here in due course). David also sang My Way, but unfortunately my phone ran out of storage space half way through! After his Keynote, David Pogue was interviewed in the media hub by Jill Ball, Australian genealogy blogger at Geniaus; she talked to him about his early career working in musical theatre and his move into technology journalism. You can watch her interview here. In the second, MyHeritage presentation, Ori Soen described how MyHeritage was founded by Gilad Japhet in 2005, from his own home, and has now grown to be the second largest family history company in the world. Their 75 million users use the site to build their family trees, and automatically connect to other trees and records using the MyHeritage "smart matching facility". James Tanner, a blogger at Genealogy's Star and a MyHeritage user, went on to explain that the MyHeritage matching facility works by not only matching user-contributed trees, but also a wide range of genealogy records, which from April, users will also be able to save as attachments to their trees. In terms of databases, MyHeritage was one of the first sites to complete the transcription of the 1940 US census last year, and in April it will also upload all the other US censuses, from 1790 to 1930. One of the main strengths of MyHeritage, however, is its large user base outside the US and Western Europe. Based in Israel, it has particularly strong coverage in Eastern Europe, Asia and Africa, so is ideal for those whose family backgrounds include those regions. Finally James Tanner announced that the first 500 people to sign up to a MyHeritage account after the Keynote session, would receive a free 6 month subscription to the MyHeritage PremiumPlus account (which is worth £7.95 a month in the UK). Needless to say the MyHeritage stand was extremely busy for the next hour or so! 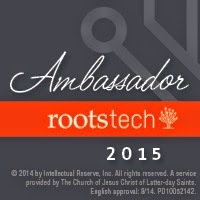 Well that was the end of RootsTech 2013. I hope you have enjoyed reading my Daily Highlight blog posts and watching my video interviews. I hope to be able to return next year for more of the same. This was a picture taken from the aeroplane as I left Salt Lake City. Next year, I definitely hope to combine RootsTech 2014 with some Utah ski-ing. It looks so tempting! excellent reports, Rosemary. Thank you. It was a pleasure meeting you. Thanks Randy, I'm glad you like them. It was a pleasure meeting you too. Great recap - thanks for the link to my video. Thanks Jill, I loved your interview with David!